I really admired the unique way the illustrator told the story along with the author in this picture book. I’m so glad I was introduced to this story through the nominations for the Blue Spruce Award and my school librarian. It’s really a picture book for all ages, not just children. This gorgeous picture book is based on the true story of Joshua Bell, the renowned American violinist who famously took his instrument down into the Washington D.C. subway for a free concert. More than a thousand commuters rushed by him, but only seven stopped to listen for more than a minute. In The Man With the Violin, bestselling author Kathy Stinson has woven a heart-warming story that reminds us all to stop and appreciate the beauty that surrounds us. 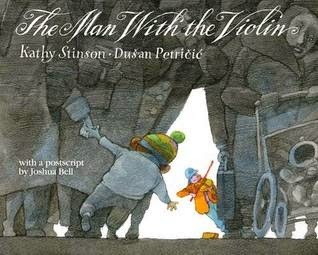 The Man With the Violin, written by Kathy Stinson and illustrated by Dusan Petricic, was first published by Annick Press, Toronto in 2013. The opening line drew me right in. I could tell this was going to be a meaningful story. One of the lovely aspects of this story is that although there’s an underlying message about “paying attention” and it lingers with you after reading, it is never once mentioned in the text. The language of the story really captures the contrast of the noisy subway and the lyrical music, but it’s really the partnership of the text and illustrations that make this book so successful. Through the creative use of colour and line, the illustrator brings out the contrast between the bustle of the subway and the peaceful moments in the music. This is a story that may need some discussion during or after reading. I really liked the notes about Joshua Bell and the Postscript written by Joshua Bell. It’s wonderful to have the itunes link included to be able to actually play the music from the story. There is a lot to talk about in the illustrations, and especially about how the illustrator uses line and colour. Although the age-range for this book is listed as 5-8, older students might also appreciate the meaning behind this book. They might also think about the different ways the author used words to convey different feelings and sounds. I've been fascinated by Joshua Bell's story and this sounds lovely. I just put this on hold. I also think my musical son will like this too! This is such a wonderful story to share. I've seen the video many times and am very happy when this story was published. I still need to get my copy, because I love classical music and it holds such an important message about taking time to pay attention. Thanks for the reminder. Enjoyed the video trailer. It's a book that can be appreciated by all age groups, I think. This is a beautifully designed book. I love the i age of the mom and child at the end. Thanks. I love this story! It's meaningful for children and adults. Sometimes we all need to stop and listen. Thanks for highlighting! What a great story to turn into a picture book. i love it when messages are subtle and implicit. One of my absolute favorite illustrators!!! Thanks! Love - "Dylan is someone who notices things. His mom is someone who doesn't." The video really helped me understand how special this book is. I've heard about Joshua Bell but didn't realize there was a book! One of the kids in my class gave me a certificate for Chapters. I'm definitely adding this one to my list. I remember reading about this in the newspaper! How wonderful the story was turned into a picture book, and it sounds just lovely. Thank you! I heard Joshua Bell talk about this adventure, but never thought to look for a book. What fun.